The quickest and easiest way for a new climber to gear up is to buy a climbing starter package. These packages include almost everything you need for indoor roped climbing — a harness, belay carabiner, belay device, a chalk bag and maybe even some chalk — everything but shoes. If you plan on taking your climbing outside, you’ll also need a rope and we he highly recommend a helmet. We examined all the climbing packages available and found three packages that really stood out, and a bevy of other packages that may catch your eye. Good: Black Diamond has combined their most popular gear and are offering it at a discounted packaged price (10% off). The Primrose and Momentum have been Black Diamond’s best-selling harnesses for years, and every few years they get a big upgrade. In 2015 they received a complete overhaul (watch this YouTube video for the details). For the price, it’s hard to beat the comfort and features. The Primrose and Momentum harnesses include molded gear loops for great racking and adjustable leg loops that can never be unthreaded, offering a little extra safety. The ATC-XP belay device is a fantastic choice as it includes teeth for (optional) extra friction and is lightweight due to the cutouts on the side. The Rocklock Screwgate carabiner is Black Diamond’s largest locker which makes it easy to manipulate in and out of the belay loop. This package is so complete it even includes chalk. Not only can this package be found at a ton of retailers, but it also has overwhelmingly high reviews. Biggest Downside: For the older harness packages in particular, it can be hard to tell what is included in the package. For example, the belay device in the photo may show the Black Diamond ATC (the basic model) but the description might say the ATC-XP is included (the model with teeth). Some photos do not include any chalk but the description mentions it comes with chalk. So it might be worth calling/chatting with the retailer to confirm what the package actually contains. Goods: This is a stacked collection especially given the price is 15% off the individual items. A lightweight friction-adding belay device, a svelte belay carabiner and one of Mammut’s most popular harnesses. Mammut has upgraded the Ophir series multiple times, and each time it turns into a better and better value. The Ophir 3 harness has split-webbing technology which promises added comfort, in addition to more breathability and less weight. The Ophir 3 harness also has an abrasion protector, so even if you’re hitting the gym daily, this harness will last for many, many years. Slide lock buckles make adjusting this harness even easier. The chalk bag comes with a brush holder and enough chalk to get you started. Biggest downsides: Part of the reason this package didn’t make the Top Pick is because it doesn’t include a women’s option, even though there is a women’s Ophir 3 harness. Unfortunately, this package is also carried by far fewer retailers and how easy it is to find is important when you’re talking about a convenience package. Sizing Note: Reviewers say this harness runs small, so if you’re near the upper end of the limit, sizing up is suggested. Goods: Since Mad Rock takes pride in making affordable climbing gear it’s no surprise their climbing package is the lowest price (both in the massive 30% off for the package deal, and on the individual items as well). Unique feature: the Wingman belay device has an added spring to prevent locking the rope, which makes it easier to give a smooth belay. Biggest Downside: To attain a significantly lower price something has to be different. In this case, it’s mostly in the harness design. The harness is totally functional, and is made in the traditional way with wide webbing covered with padding to spread the load. By contrast, more cutting edge harnesses have additional features (like “split-webbing” or more shapely designs) that allow the waist band to distribute the weight better and add more breathability. But if you want to save money, with a totally usable, practical, and safe package, this is a great option. The biggest reason to buy a packaged deal is because it’s fast and easy. If you don’t want to delve into all the details of gear, a packaged deal makes it simple and convenient. 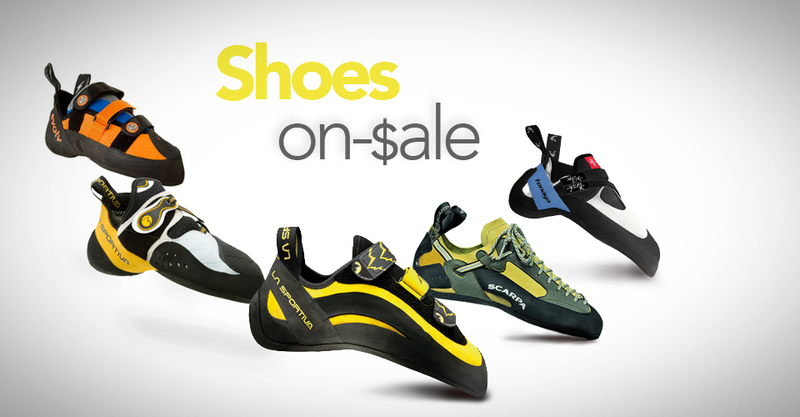 You have everything you need to get started climbing indoors (other than shoes). Packaged deals also make it really easy to give as a gift — you’re able to quickly and easily give your loved one a complete package, and that climber can always choose to upgrade later on. Some packaged deals offer bigger savings than others, ranging from 0-30% off of the total price of items sold separately. And if you have a coupon for 20% off one item, these package deals allow you to take further advantage of that type of sale. Packaged deals can be frustrating for anybody who wants very specific items. They don’t allow you to mix and match your preferred gear or brands. If you already own a piece or two of gear, the discounts of the packaged deal aren’t big enough to make it worth buying, unless you have a partner in need of gear as well. Packaged deals can also be disappointing for those looking for certain gear qualities, like a harness with fixed leg loops (where the leg loop size adjusts with elastic instead of buckles), or a belay device that has advanced features for multi-pitch climbing. Not into a packaged kit, but still looking for a good deal on a harness? Good: If you find you’re often between sizes, this harness may be key. It offers 2 buckles on the waist for broader fitting range than most harnesses (including Black Diamond’s other models). So if you want to wear this harnesses with pants, shorts, snow pants, and all sorts of layers, or you’re the type of person who can easily fluctuate 15 pounds a week, like Allen, our previous roommate, then this harness will probably fit better. Biggest downside: There is no women’s version, and it’s hard to find the men’s package. 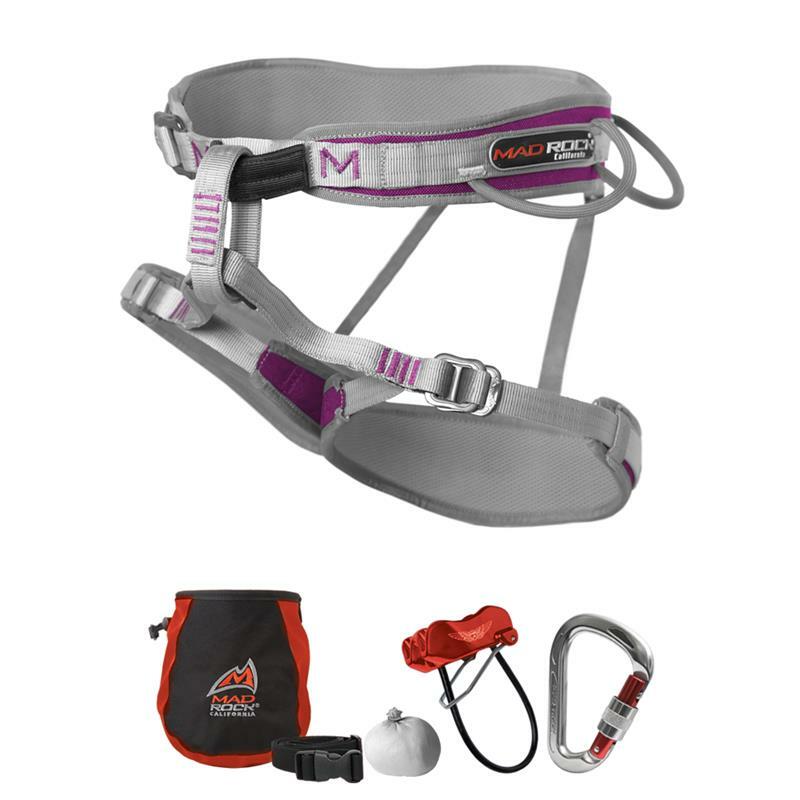 Since this harness has aluminum buckles (compared to the plastic tracFit buckles on the Momentum) it comes at a higher price tag and the whole package does not seem to include a chalk bag nor any chalk. This means that the savings of buying a complete package is more of convenience than an actual price savings. 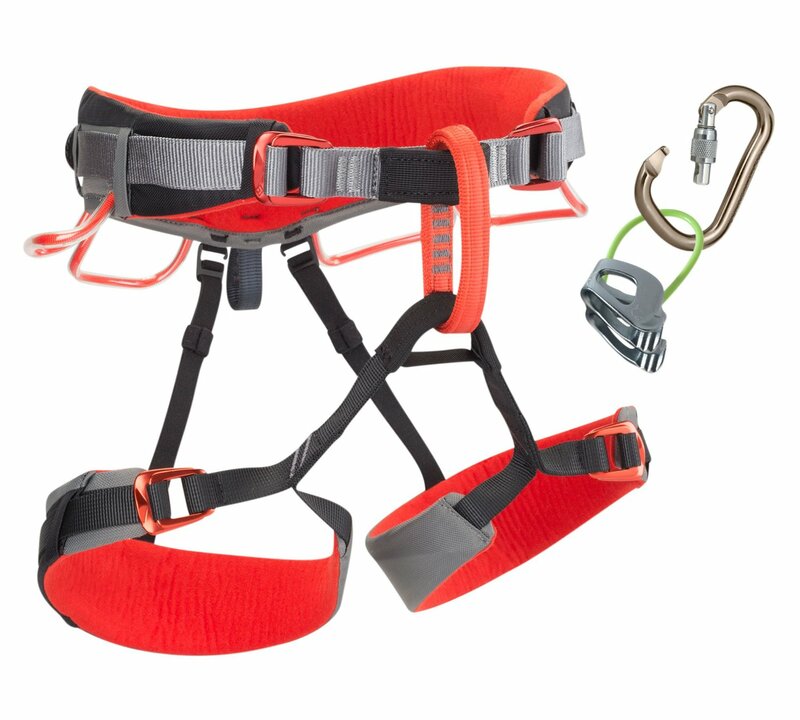 Goods: This 2016 harness debut is purposely designed for new climbers and includes more safety details in case the harness is used improperly (like reinforced gear loops). The harness also has Easy Glider buckles to make adjusting the size faster and easier. And the waist belt design allows for a very large range of sizes. We made a video of all the features of the Zack that you can see on YouTube. The belay device also has teeth to help add friction when belaying heavier climbers. Biggest downside: The harness has less padding than some of the other models available. Also, since the belay device and carabiner are not sold separately, you won’t be able to research additional specs or reviews on them. Goods: This is the only harness package that includes CAMP’s patented belay system where you thread your carabiner through a split in the belay loop. This prevents twists and rotations to ensure the carabiner is never cross-loaded, even if you use a carabiner without a belay loop keeper. The included HMS carabiner has a wide opening for easy maneuverability. Biggest downside: The belay device is CAMP’s most basic model and doesn’t include any friction-adding features like teeth. But, if you are primarily belaying climbers that weigh about the same or less than you, this is less of an issue. And although the picture shows a brush in the chalk bag, we’re pretty sure it’s not included. Goods: This package even includes a mesh storage sack, and a chalk ball (more products than any other package) and it’s a bit less expensive than some of the other packages as well. Biggest downside: The included harness doesn’t have any padding. If you really get into climbing you’ll probably want to upgrade to a more comfortable harness quickly. But, when you upgrade, you could then use this harness as a loaner since it’s construction makes it suitable for an incredibly large range of sizes compared to most harnesses (20” – 45”). Since the description of this package doesn’t mention model names specifically, it’s challenging to find concrete details about the items available in this package. Often at WeighMyRack we talk about the “right tool for the job.” And before recommending gear we want to know super detailed information of where you’re climbing and what style (ie. gym, sport, trad, alpine) so we can help you choose the most customized gear for your situation. In this case, these packaged deals are all incredibly similar. The changes we’ve identified above are subtle in quality, design, and price. 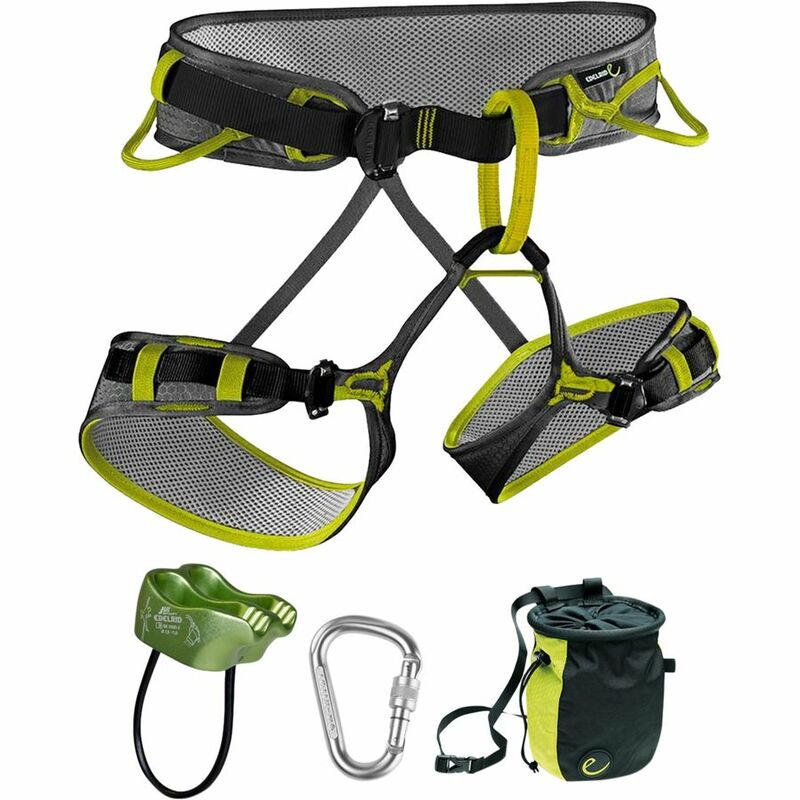 These starter harness packages are perfect gifts, all suited for a new climber looking to start climbing quickly. And the majority of the these packages could easily satisfy a climber for years of enjoyment before an upgrade is needed. Most of the links to retailers in this post are affiliate links, this means we get a small commission if you click them and then buy something (we appreciate your support!) Rest assured these links have not changed our opinion, and we would have linked to the same places had we not been getting a commission.